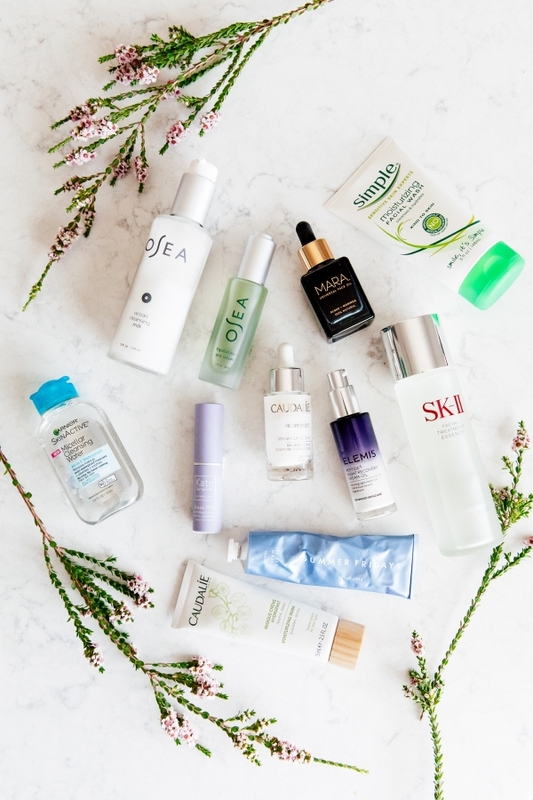 I always get a TON of questions about my beauty and skincare routine since becoming pregnant and finally have a big roundup for you on the products I have been using and loving. This is my dream team. I have tried many more products but these are the ones I am still using today and on my current rotation. I have split them up into 3 categories: skincare, SPF and belly. Hope you enjoy! I remember being so overwhelmed at the beginning of pregnancy trying to figure out what parts of my skincare routine could stay and what could go. Luckily I was already using a lot of products that were considered to be safe and I added some other steps into my routine in the meantime. I have pretty sensitive skin so I never like to change up too much stuff at one time so I can monitor how my skin reacts to products. Happy to report some new products below that I added to my old routine. I also can’t stress enough that these are things that work on my skin and they might not work for you. I also highly suggest talking to your doctor with any questions about what is safe for you during pregnancy. I would always bring a list with ingredients to my doctors office to get them approved at the beginning while I was learning what ingredients were considered to be safe. simple moisturizing facial wash: Been using this for years and continued to use it during pregnancy. What I love is I can always pick it up at a pharmacy or target in a pinch. osea ocean cleansing milk: I discovered this brand recently when looking for clean skincare options. I love to use this face wash at night and it leaves my skin so moisturized. caudalie vinoperfect radiance serum: I used this before and during pregnancy. Caudalie makes some really great products and this one goes on every morning. It goes on silk smooth and leaves my skin feeling soft, moisturized and radiant. osea hyaluronic sea serum: I alternate this serum with my caudalie. This one has a sticker consistency (if that makes sense) and I feel like it gives my skin a boost of moisture. elemis peptide4 night recovery cream-oil: This has been one of my favorite night time routine additions since becoming pregnant. I was never a big oil person and what is great about this product is not only does it smell like a spa (in a good way) but it’s the perfect cream-oil combo. This is usually the last step in my skincare routine at night and I wake up with glowing, moisturized skin. Did I mention how good it smells? Love this stuff. mara universal face oil: Like I said previously, oils are starting to grow on me. This one has worked it’s way into my routine in a few different ways. On days where I go makeup free, I love to pat some of this oil into my skin for some extra moisture. It also smells incredible. I have also been adding 2 drops of oil into my bb cream or foundation to give my makeup a more luminous and glowy look. What I love most about this oil is it absorbs easily into my skin which is huge for me since I am just getting into oils. kate somerville goat milk de-puffing eye balm: I used this before and during pregnancy. This is one of my go-to eye creams. It’s so easy to apply since you apply directly from the stick and I love how it de-puffs my eyes in the mornings. Also Blake is so into this eye balm. We both have our own container but I stole his to throw in my hospital bag. caudalie moisturizing mask: Love so many caudalie products and this mask is a great pregnancy save option for moisture. I actually bought this while in NYC traveling and what’s great is it’s super easy to apply and then wipe clean when done. summer friday jet lag mask: I always get questions on if this mask is worth the hype and I have to say I was really impressed with it. I bought it when I was actually pregnant and was so happy such a hot product was made so clean. This one smells amazing and I have been using this as a once a week overnight mask. So I actually leave the product on to sleep. Love that this one can be used as a moisture primer underneath makeup or just as a quick under eye mask. It’s a winner in my book and works with my sensitive skin. garnier micellar cleansing water: I used this before and during pregnancy. I love using this to ensure I have removed all my makeup. It’s like my second cleanse after my makeup wipes and I feel like it really get’s my skin back to square one. It’s super gentle on my eyes which I love also. sk-ii facial treatment essence: Another cult product I was so excited was pregnancy safe. It’s become a part of my evening routine to tone my skin. What I didn’t realize is that when you are pregnant, your skin can become much more sensitive than normal. I remember going into a doctors appointment with a sunburn and my doctor said said that I discovered that pregnancy skin sensitivity to the sun. Man was she right. 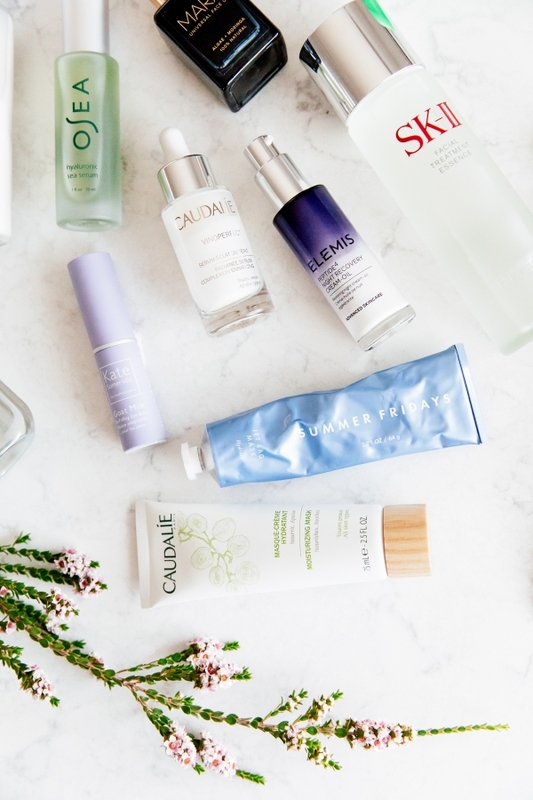 It’s been more important than ever to make sure to have SPF be a priority in my beauty and skincare routine. Below are my favorites. olay complete all day moisturizer spf 15: Been using this for years and it’s a go-to for me to throw on every single day to ensure I have spf to protect my skin. It’s really lightweight so I am able to use it year round. I also love being able to pick this up at a pharmacy or Target. olay total effects whip spf 25: This is a newer product in my rotation and what I love is how it’s thicker and more serum like than my other olay moisturizer. Love it for those Summer days where my skin is craving a heavier dose of moisture and I still want the spf protection. 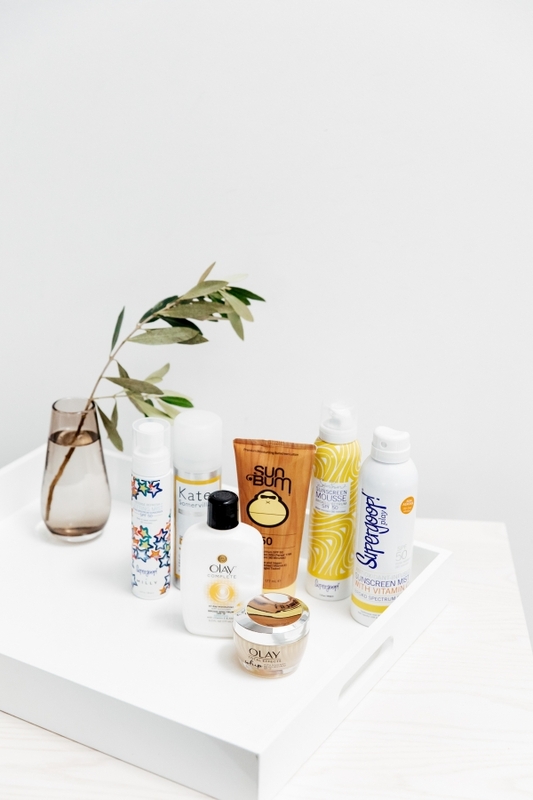 kate somerville uncomplikated spf 50 setting spray: A newer setting spray I have added to my rotation because I am all about making sure I have triple spf on my face. What I love about this one is that it’s more continuous spray so it’s super easy to apply. supergoop setting mist spf 50: I used this before and during pregnancy and I can’t say enough good things about supergoop. Such a great spf option for a makeup setting mist. 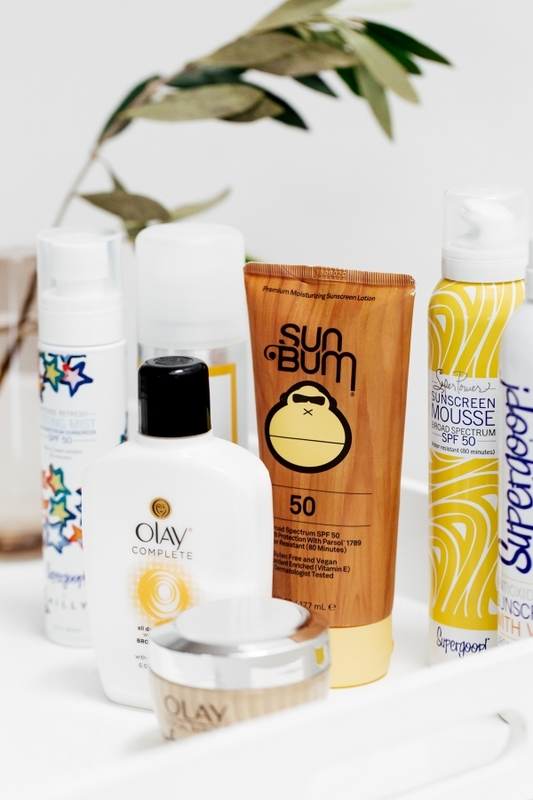 sun bum spf 50: Always a favorite SPF lotion. I brought this with me to Hawaii with the others below and didn’t get sunburnt once. Being pregnant, I notice my skin is much more sensitive to the sun. It’s been so important for me to apply sunscreen and be mindful to reapply more than I normally do. supergoop sunscreen mouse spf 50: I was surprised that I would like a sunscreen mousse. It’s unique in texutre and I feel like it does not leave much residue on my skin which I love. This stuff is keeping my baby bump from getting sunburnt and I love it. supergoop sunscreen mist with vitamin c spf 50: I love having one spray sunscreen option that makes it easier to reapply at the beach. So this one has been on repeat to make sure I don’t get burnt. Let me start by saying I tied alot of products for my belly alot of which I did not love. Some oils that were just way too greasy for my liking, things I could not stand the smell of, and formulas I just didn’t like. Smell is such a big component in these because let’s be honest, you turn into a blood hound when your pregnant and your nose is picky and alot of times the nausea is so bad a smell can set you off. The below products are the 3 I have used my entire pregnancy and worked for me personally. bio-oil: This was one of the first belly products I started using in the early weeks of pregnancy. This is actually the second bottle I have gone through and love how easily it absorbed into my skin. For someone that is not a big oils person, this was a great product to start using. hatch belly oil: I got this oil a bit later in my pregnancy and it’s become my new everyday belly oil. What I think is genious about this one is that it has an eye dropper so it makes applying it way less messy. Also, it smells amazing and it doesnt hurt that the bottle is gorgeous. It absorbs really quickly into the skin which I love so I can get dressed quickly after. mama mio the tummy rub butter: I wanted to make sure to add a lotion to my rotation for days spent in the sun and when I wanted an extra dose of moisture. This lotion is like BUTTER. I go through it a bit more quickly which is why I don’t use it everyday. It feels so luxe and I feel like it’s such a treat when I get to use it. May - Love Olay’s All Day Moisturizer. Been using it for years as well!